Match Day has come and gone. A whirlwind of emotions has hit medical students on that day. Some joy, some of ambivalence, some of disappointment. However, no matter what emotion you feel that day, you will need to start planning for lays ahead of you. The rest of your 4th year should be relatively easy as you will probably need to spend some time finding a new place to live and things like that. However, here I will deal with the biggest elephant in the room: Student loan debt. Ok, first things first. For those of you who went to a state school, good job, you are extraordinarily lucky. By virtue of your significantly lower tuition your student loan debt will be significantly less than that of your colleagues who went to a private school. How scary your debt actually is will be reliant on your probable salary as an attending physician, cost-of-living where you plan to live, and lifestyle. A general ballpark “pain scale” would be: < 50k is excellent, < 100k is ok, 100k-200k is rough, 200k-300k is soul-crushing, > 300k is horribad. Full disclosure: I was in the “horribad” level after finishing my residency/fellowship, as was my wife. That is > 600k total debt combined, “more than small countries” as I used to say to my friends. The most painful thing about student loans is the compound interest on them. Luckily, I was in the era that student loan interests weren’t quite yet at the egregious levels they are at now. The majority of my loans were able to be consolidated at less than 4%. Here are the 2015-2016 interest rates. 5.84% and 6.84%. Painful. This was even higher in 2010-2013 where it was 6.8% and 7.9%, which probably includes some of you matching in 2016. Ugh. The annually updated interest rates can be found here. For those of you with < 100k of debt, you honestly don’t need to worry all that much. You should be able to get rid of the debt without too much difficulty. 1. Consolidate into a federal loan program that is eligible for federal programs (RePAYE), once you get your last loan(s). Refinance private loans. 3. Finish residency, and start making attending money. a) If the interest rate is >6%, put as much extra money toward it as possible. b) If the interest rate is 4-6%, this is kind of a wash: you can max your 401k/403b and then put the rest toward these loans, or if you hate your loans, put it all toward your loans. c) If the interest rate is <4%, max your 401k/403b, and then put the rest towards loans. (Assuming you are using index funds and the philosophy). For those of you with 200k-300k of debt, you need to decide right now how to attack this debt. The higher this number is, the harder it gets. Do steps 1-3 as above in Scenario A. 4. Refinance federal loans and continue with REPAYE for 3 months as an attending. Refinance private loans (should be able to get a better rate now). 5. Save an emergency fund of 3-6 months of living expenses (food, rent, car, etc) and have that in the bank. 6. Figure out whatever above the month-to-month expenses of extra money you will have a month. 7. Multiply that number by 0.75, ie, if that number is $2000, then your amount is $1500. 8. Add whatever that amount is to your loan payment and make it come out automatically. 9. Once your loans are below 50k, you can look at step 4 of Scenario A. For those of you with > 300 k of debt… I’m sorry. I’ve been there. It hurts. Prepare yourself. In this scenario, you will be doing a “spray and pray” approach. Whenever you have extra money, you throw it at your loans. 5. Try to live with your parents or have a roommate(s). Having free/decreased rent for the first few years after finishing residency is hugely beneficial. 6. Live like a resident. Don’t buy a new car, house or anything until your loans are at a reasonable level (<50k). 7. Save an emergency fund of 3-6 months of living expenses (food, rent, car, etc) and have that in the bank. 8. Figure out whatever above the month-to-month expenses of extra money you will have a month. 9. Multiply that number by 0.90, ie, if that number is $2000, then your amount is $1800… whatever that number is, throw it at your loans. 10. Every 3 months, check your bank balance, whatever is in there over your emergency fund, throw it at your loans. 11. Work extra shifts and do some locums work. After accounting for taxes on the extra work, throw it at your loans. 12. Once your loans are below 50k, you can look at step 4 of Scenario A. 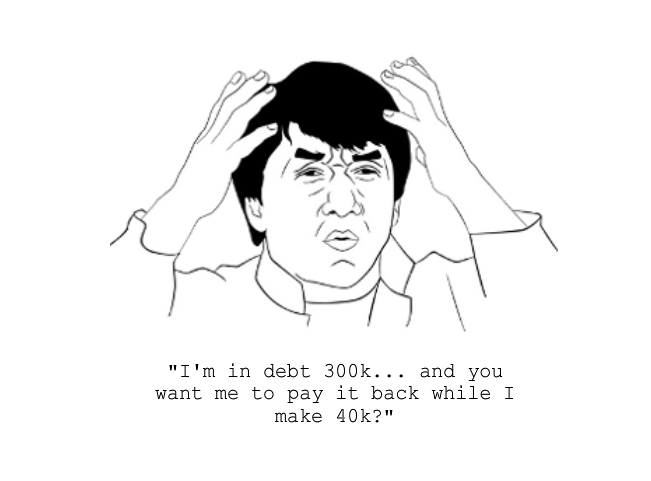 Should I be putting money into my 401k/403b if my debt is 200k? 300k? Ask yourself this: How much is getting rid of your debt worth to you? Remember that compound interest works both ways. If you believe in index funds, then you potentially could come out on top by drawing your loans out for longer if the interest rate you have on your loans is less than your expected return. As I’ve alluded to before, 7% is a reasonable estimate for long term returns on index funds. However, overall, I am a fan of being more aggressive towards loans. So I think the number to remember is 6%. Overall, the answer to this question is dependent on the individual’s comfort level with their debt, faith in index funds and compound interest, and interest rates on their loans. In general, I think it is preferable to be more aggressive toward your loans when your debt is > 200k. Just remember that whatever the interest rate for your loans are, you need to be pretty confident that your 401k/403b will beat that long term. Things can get a little complicated if there is an employer match involved… However, but as long as the match is reasonable and your loan interest rate is less than < 6%, you will most likely come out on top overall even though you will drawing out the payments on your loans. I am maxing my 403b and my wife is maxing hers, even with our horribad debt. My wife and I have loans with fixed interest rates below 4% and I will be paying them off over a longer period of time. Both of our 403bs have some degree of employer match. I am pretty confident that even though we will be paying off our loans over the long term, that it is STILL BETTER than paying off our loans early. I live in a very high cost of living area and have two young children in daycare which costs a significant amount of money. However, I fully expect that once my children are both in public school in a few years, that I will be able to pay off most (it not all) of our student loan debt as we will be throwing a ton of extra money at our loans every month. All of the above scenarios are based on a lot of assumptions and should serve as starting points and guidelines for how to tackle yours. What about Public Loan Service Forgiveness (PLSF)? PLSF is kind of a difficult decision and one you will need to make upon graduating. If you are planning to work for a PLSF eligible institution (501(c)), and do it long term (10 years), then you should move from a RePAYE plan to an IBR or PAYE plan because it caps payments at a 10 year standard repayment before you start your first job. By doing this you pay less toward your loans that are eligible for PLSF, and more of your loans will be forgiven overall. However, I’m not sure if PLSF will be around forever and even if you decide do PLSF, I wouldn’t count on it. If you get the forgiveness at 10 years, great. However, if you don’t get it, or only get a fraction of it, it shouldn’t matter to you because you never counted on it in the first place. What do you mean by refinance federal loans and refinance private loans? This one lets you fill out one app and then a bunch of different lenders give you an offer. Social Finance (SoFi, for short) was one of the first companies that started doing the student loans refinancing thing. They’ve been around for awhile and have a pretty strong name overall. LendKey is another one where you fill out where one app and a bunch of different lenders give you an offer, but the difference is that they are all community lenders. CommonBond has been around for awhile too. Of note is that they also refinance Parent PLUS loans as of ~2015, which may be important to some. Earnest allows for some interesting customization options. A relative newcomer, but one of the few that will refinance residents. However, there are many, many players in this market now, and competition is good. For the most part, these companies compete with each other to give you the lowest rate possible, usually significantly lower than what you are paying right now. If it was me, I would just sign up for them all and see who gives me the lowest rate. 1. Don’t refinance your federal loans if you are planning to do PLSF. The companies linked above have my referral link built into them. I would appreciate that if you do decide to refinance that you use one of the above links. This would help offset the costs of running this site. Consolidate federal loans. Refinance private loans. Refinance private loans +/- federal loans after finishing residency based on whether you are going for PLSF or not. Live like a resident and make plans to make your loans disappear. Once your loan balance is zero, write me an email and thank me. Just kidding. But seriously, send me an email once you’re at zero and let me know how it went for you. Tell me if my advice helped or didn’t, or if you have your own advice to give. I would love a guest post someday from someone who followed my general game plan and what changes they made. Agree with your strategy and recommendations. Highly recommend REPAYE for all those in training and possibly even for people going into a low income specialty depending on their debt level. I like the stratification of debt level and the Jackie Chan cartoon. I fortunately was a little less than $200k when I was finished, although the spouse also had a similar amount of debt. I can never wrap my head around PSLF. It works great if the circumstances fit you, although if you are in a potentially high income specialty (like Rads or Anesthesia), you should theoretically be able to power through that debt within a few years. To each his own, I suppose.